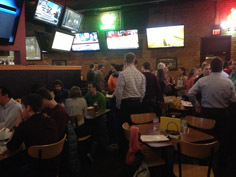 The APWA-MN Student Chapter held its first Networking Social of the new year Feb. 3 at Buffalo Wild Wings in Stadium View. For those who attended, we hope you enjoyed yourselves. For those who couldn’t make it, opportunities are still available. The new officers would like to thank everyone for showing up and making our first event a huge success. The turnout was amazing, which bodes well for our goals to increase chapter membership. Many of the attendees were underclassmen, which was an added bonus since the majority of the current members are older students who will be graduating within the year. It’s great to see more of the younger students engaging with the professionals. We hope you all can make it to the rest of our events to enjoy the perks of being a member and each other’s company. APWA-MN is a great group to join so email apwa@umn.edu for more information! Thanks again for everyone who showed up, and we wish you good luck on your internship searches!